An Apple ID is central to just about every Apple service you use on an iPhone, iPad, or iPod touch. From sending and receiving iMessages and FaceTime calls, to shopping with the App Store and iTunes Store, and making backups to iCloud, this is all tied to an Apple ID. For the best experience with iOS devices, you’ll want to be sure each of your own hardware is using the same Apple ID. With that said, there are times when you may want to change an Apple ID associated with a specific iOS device. For example, using an Apple ID without a credit card associated with it for a kids device, or if you ever switch hardware or give an iOS device to someone else, you’ll probably want to change the Apple ID on that device so that it is no longer related to yours too. 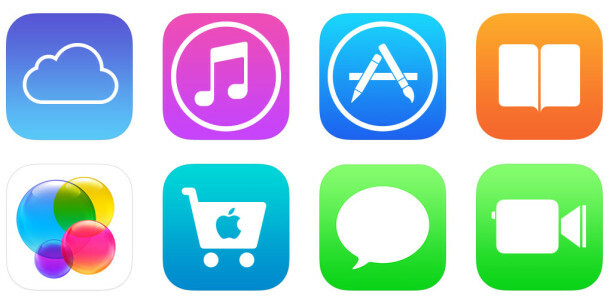 And of course, many international users may want to switch between multiple Apple ID’s set to different countries so that they can access different features and App Store content. 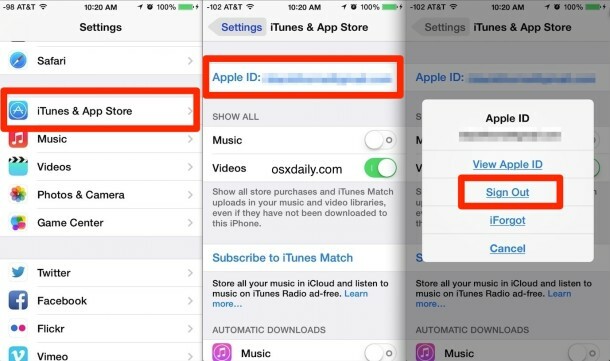 There are really plenty of scenarios where changing the Apple ID associated with an iPhone or iPad is necessary or otherwise makes sense, so let’s learn exactly how to do that. If you forgot an Apple ID password, there’s an option for that too under the Sign In button, otherwise you can manage it online at Apple’s site. Keep in mind that changing an Apple ID on a device that is using it can possibly cause unexpected issues with iOS and conflicts with some apps. For example, if you own an app on one Apple ID but not the one being changed to, or if you’re logged into an Apple ID that has Game Center details associated with it and the new one doesn’t. Thus, you’ll generally only want to do this on a device that has been freshly reset to factory default settings or that is otherwise a clean slate without any critical App Store and related downloads tied to it. I have ended up with two Apple IDs: one for iTunes and App Store purchases, and one for iCloud use. Is there anyway at all to merge these so I only need one Apple ID? Unfortunately there is no way to merge multiple Apple IDs into a single Apple ID. You’d probably want to pick one and just stick to that exclusively from now on if you can. Great stuff. It’s a big pain in the arse to deal with changing your Apple I.D. password. It’s great that you’ve thought to post instructions for changing the Apple I.D. It’s insane that Apple has not came up with a better way of doing this. I recently changed my password, and I had to change the password on two Macs, two iPhones, and two iPads. Why can they not make it so that the change gets pushed out to the other devices automatically? It’s enough to make me never want to do this again. I’m an Apple certified tech, and it’s hard for me to do, think of some old lady having to do this who doesn’t know much about computers. This is a big opening in the future for other companies to take down apple. It is stupid for them to not figure out how to merge IDs. What a pain. If you’re frustrated as a tech, imagine a mom in her 40s who is not tech savy at all. The whole Apple ID problems should be fixed. We had to start from scratch on our sons ipod as it was receiving all of his sister’s texts — rediculous. Setting up a device should not be a full day affair. The crazy thing is, our daughter’s ID is different from mine … yet they were connecting. Thanks again for the help though so we could at least properly sign his device out of the Apple ID. It was a sigh of relief for us. I cannot wait for you idiots who assume a woman in her 40’s is less tech savvy than you are when you become men in your 50’s who still have to order takeaway to be fed. You are, of course, correct. However, I am a 60 year old man who has no problem feeding myself and hate takeout. It seems to me that you are guilty of the very offense that you are complaining about. Howie- its about Security. One reason to change a password is to prevent unauthorized devices from continuing to use your account. Pushing a new password to everything that knew the old password would defeat the purpose of having a password at all. I don’t see that option anywhere? I have a problem with my Apple 5s. The Apple ID on the phone is different to the one I normally use on my Computer. And I don’t know the password for the Phone ID. I want to reset to Factory settings but cannot. Is it possible to set a new Password for the ID on the iPhone? Or is there any other solution. (incidentally I must have used at least 20 different passwords for apple ID it seems that every time I log in it rejects the most recent one, won’t accept one the has been used before… and so on. 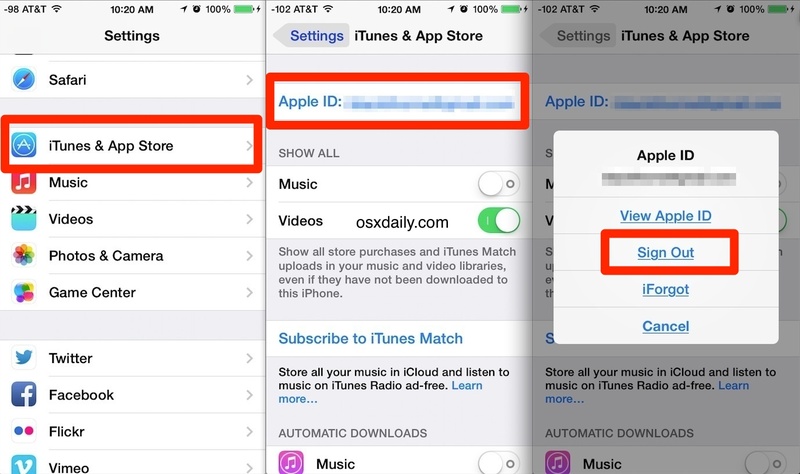 This is about changing an Apple ID in iOS, you can change an Apple ID on the iPhone that way. You should read the article and follow the written instructions about how to change the iCloud and Apple ID. By the way, did you actually read your comment? It’s illegible, painfully difficult to read. Incomprehensible. Where on earth did you learn to write like that? Please stay in school, learn punctuation, grammar, etc. It would make it a lot easier to follow instructions on how to change an Apple ID too. I’m also finding it very difficult to change the Apple ID on my iPhone 4s. Unfortunately, the Apple ID pop up window shown and discussed in the above instructions does not appear on my iPhone, thus making it impossible to move the process forward. If you have any further ideas I would be very grateful. Be kind. This is clearly not an English-speaker, more like ESL. In fact, it could be a hearing impaired person as well… They often have Iphones to play games on. This is an excellent point granny, and while some of the comments may not be about changing an Apple ID on an iPhone or iPad, it is still important to remember that not all users have the same capabilities. I have in my iphone 4 my ID account, but when i have to update the applicacion, ask me for one account that is not mine, but from my bf, something that i dont want in my phone. I have made all the necessary things to change, log out, restart, refresh and remake the industrial settings, but absolutely nothing. What i made wrong??? Thanks. I have just purchased a new iphone5c running version 8.1 from a “Friend”… I am now finding out that it was his girlfriends phone. With that being said, it has her iCloud, iTunes, settings, etc….. So, how can I circumvent this and replace the info with my own and begin using this phone??? You can’t assign a new AppleID account until you have your friend’s girlfriend unlock it with her appleid account and password first. It’s a security feature which renders iPhones/iPads useless in the event they are stolen or lost. You’ll have to get the girlfriend’s AppleID and password from your “friend” to unlock the phone or from the girlfriend if you can get a hold of her. Once it’s unlocked, then you can replace it with your own. is there any other option aside from asking the previous apple and icloud id and password from the previous user? I have same problem with my ipad. I don’t have contact now with my friend who knows the password. I took my new phone to the local Apple store. They were able to reset the phone. I then went to my iCloud and entered my password. I could then select from a previous backup and then I had my phone back. My new iPhone 6 decides when it wants to receive texts and when it does not want to receive texts. My husband and I are on a group text with my family; I can be sitting right next to him (he also has the iPhone 6) and he will receive the texts and I won’t. They NEVER come through on my phone. It is very frustrating, and I can only imagine what other texts I am unknowingly missing. How can I fix it? I have an iPod touch 4th gen, which I want to restore to factory original in order to give it to one of my children. (I have a new one for myself so I no longer need this one and have already backed up everything that I wanted to keep onto my new one.) I have tried to restore it 3 times now and it keeps asking me for my passcode, which I assume is the same as my lock screen passcode. I have put it in over and over, CORRECTLY. And it keeps saying that it’s incorrect. WHAT. THE. HECK. Seriously. I am at wit’s end and I cannot “afford” a tech call to apple. The last time I called (for issues related to IOS 8) I was literally on the phone for 2 hours and 38 minutes. They were great but I do not have time to do that again nor do I feel I should have to pay them in order to do something that should be a no-brainer…Reset to factory original. My lock passcode has only changed twice since I got this a few years ago and I have tried both. Neither work.. although I would assume that it wants your current lock passcode. (And that works just fine to unlock my screen even now!) Help! This is supposed to be a gift for my kid’s birthday on Friday and I am running out of time to get this fixed if it’s even possible. After a lot of hassle, I eventually managed to get their Apple ID details to sign them out in order to create my own ID. its came us as a menu asking for settings as if you’ve just bought the phone. And now I’m just waiting until I have a sim card to use as it is required. Will that now mean the Iphone is eligible to create this Apple ID? Yes if you reset the iPhone as new it will be like a new phone with nothing on it, you can put your icloud account on it then. Yea!!! You haven’t tried what you just wrote. I have been trying to accomplish this for 2 weeks now and it doesn’t work. Log out of an existing Apple ID, then log in with a new Apple ID. That is how you change an Apple ID on an iPhone or iPad, it works and that is how it is supposed to work. You can’t log in to a new APple ID without logging out of the old one! I want to switch iPhone 5s’s with my husband, I did the upgrade to ios8 and don’t like it. Do we need to go to a store to do that? After logging out of iTunes as described above, powering off then on, then logging in with the new AppleID, the iTunes app still asks for the password to the old AppleID. What am I missing? Byron, I just realised Apple has actually made it easy to use two accounts on an iDevice and this is great, specially when you used to live in the us as I did and now in Europe, just sign out / sign in ! Most of all, BEFORE, you could not update the apps of let’s say account 2 (you are logged out of), if you are logged in to your account 1. But now, when logged in to account 1 and some apps need updating from account 2, iOS simply will ask you the password of account 2 to update them ! This is just great, and if this works as simply as it does seem to work, I can finally use my two accounts without having to worry about unusable apps and updates and payment means to renew and stuff like that. My niece is using her moms iPad. Mom passed away 6 months ago. I had the Apple ID and password for the iPad. So I went into the account on line and updated the email address to a new one knowing at some point the old email address would be deactivated by Yahoo for lack of use. I’ve had no problems with purchases etc. The problem is now I want to Erase and restore to factory settings because of an issue with Instagram and the old email address is showing up when I get to that portion of erasing and Even putting the PW associated with that ID/email address is not letting me erase/restore. Thoughts? Our four family members are currently on one AppleID. I need to separate them because it’s messing up our iCloud. If I change the ID on my iPhone, will I still have all of my apps and contacts? I plan to set up family sharing after IDs are changed. Please can anyone help. I have taken over my daughters iPhone 4s. She has removed her apple id . When I try to make one for me it lets me choose language, create password etc but right at the end wwhen I think I have completed it ,it says can no longer crate a free apple id on this device? What does it mean and what do I do? So enter your existing Apple ID on the iphone, if you need to make a new one make one on the web rather than making one on the iPhone. You’re saying what the message says and then asking what it means, well what does it say? That’s probably what it means. Reading comprehension. Do not reply if you don’t know what your talking about. It has nothing to do with reading comprehension! The problem is you can only have 3 Apple IDs entered on one phone. So if you have a used phone you cant make a 4th ID and the phone is unable to create one or sign into one. Hi, I have keyed in the wrong email for my apple ID into my iPhone 4 and now I cannot log out to sign in correctly. When ever I try and log out, to delete the incorrect account it pops up saying “sign in to turn off where’s my phone” – but I cannot sign in because this address is not valid. There is no way for me to change it, I have restored the settings on my phone and again, it’s already here.. Please help me, I want to sync to my iPad and computer. My boss has an old iphone 5 that does not currently have service and it does not have a sim card. How can he find out what the apple id associated with that phone is? I currently have two phones associated with one Apple ID… Question is if I create a new Apple ID to separate the two phones, can I make sure to retain or recover the current apps on both phones without having to use an actual computer and plug phone in to access iTunes account? I hope this makes sense. It has become a mess to share the Apple ID and hoping this is something that can be fixed without too much issue. iPhone 5 is locked. please help? Nice article but when I go to iTunes under settings, the iPad will not let me select the Apple ID to change it. I’m extremely frustrated. How do I fix this problem? Client totally can’t remember all the passwords that was set on the ipad. May I know how totally to remove it and totally erase put a new user? I have an apple iPhone 5 that has reverted back to original settings for my apple id and password with all other information. Now I am trying to erase the phone back to default and unable to turn off locator because it required apple id from 2 yrs ago when I first set up my account, since than I have changed my password multiple time and no longer remember my password as It will not accept my current id and password. Please help me with where to begin this problem . Hiii i have iphone 4 i change my new apple id & when i put new id in it shows u already login with number of apple id so now you cant login with apple id so please help me how can i login with apple id. How to delit previous apple id?? Once i use my apple id in my friend new ipad & I downloaded some applications now he insert his apple id & password & when he insert his card in ipad air 2 64 gb my contects shown in his ipad so kindly request you please give me solution asap because i rest all content & setting but still its apear in his ipad. I have a problem… I Logged out of my old account into a new one and now every time i try to update my apps it askes me to log into the old account to connect with itunes and i don’t know my old password anymore . That’s because your apps are registered to your old account. So reset the password to your old iTunes account, or delete those apps. Somehow my husbands e-mail has become my appleID. When I go to settings and try to change it…it has the correct ID. When I went to go do my App updates it asked me for the password to my husbands AppleID? First, how do I fix it? Second, how did it happen?? I recently sold my old iPhone four to a friend and he later came back to me saying that he needed my old Apple ID and password in order to access the phone. I don’t remember what it is since I have a new phone and Apple ID. Is there anyway to change the password on the old Apple ID? Yes it’s pretty easy! Just initiate the password reset process for the old Apple ID using the email address used to sign up for it, no problem! Currently my daughter shares my Apple ID with me. She is receiving my phone calls etc….therefore, I would like to change just her Apple ID on her phone. Will she lose all the content on her phone such as pictures? i have iphone 5, at first i couldn’t create an apple ID and afterwards i have created apple ID through icloud. Now, i want to create id but couldn’t create ID. I have signed out of icloud account, when i try to create apple ID from itunes stores and app stores there is already an icloud id popping up in apple ID. HELP? I have an iPhone 5s and a 4. Both have an Apple ID associated with an email that no longer exists. However, the phone keeps asking me to enter the password associated with that Apple ID in order to use the iCloud function. The password that is associated is not working and I cannot ask for a temporary password b/c the email account is not in existence. How do I delete forever that old Apple ID? Hi, I am using iPhone 5. And when I first purchased it my friend created an apple ID using his gmail. And all the data were synchronized with his data now i want to create my own apple id and the features are not letting me through so please what can I do to make my phone filled with my own data and my gmail and my account. How to rest my IPhone 4 store id ? My issue is my Apple ID is under my old email but that one got hacked into so I no longer use it how can I change it to my new email address I’ve tried adding the email address but it doesn’t allow me to switch it to primary. My friend has her husbands old iPhone. So, she needs to go into the iTunes & App store section in Settings, then logout, then create new apple id. How can she make sure she won’t get stuff from her husband’s apple id and he won’t get her stuff??? i merged my ipad2 and my iphone,but now i want to separate it because i gave my iphone to my wife…my problem is,if i change my ipad ID,it will effect my iphone or not?? I want to delete this email account..how can you help me ?? An ex bought me this iPhone. He kept asking for it back but he won’t come get it. I reset it to the point where I need the apple id and password but again it’s useless because in don’t have his info and he won’t come get into. What do I do ? Great job Terry, yes you can change your Apple ID password on your iPad Air. Read the instructions and you will change the Apple ID or Apple ID password. Please help. My iPhone asks constantly for my password. It accepts it, but Always comes back with a message that it cannot verify. Why is this? Also, my iPhone is hooked up to an old, expired email address. Do you recommend I try and change that? If I do, will it work better? Please help. Thank you. I cannot believe we are still allowing Apple the Jerks to tell us how we have to manage out material. It’s big brother trying to protect us from ourselves. Changing your Apple ID on their site should propagate throughout the system, if they did it correctly. I can’t believe the steps I have to go through to help those less technical folks who don’t understand the Apple mentality. Trying to control every aspect of your device is a disservice to anyone using the devices. I love the phone and what it does, but I’m pissed every time I have to make a change at the stupid programmers who make it so unfriendly to the average user. When I try to update my apps in the App Store I get window that says sing in to iTunes Store enter the password for your Apple ID then has my email address but instead of .com it is just .co. I have tried logging out in iTunes, I went to appleid.apple.com and logged in and out there. I have even tried resetting all the settings on my phone. Nothing has worked. iTunes shows the full .com with my email address, when I go into settings>iTunes & App Store it shows the full .com. It is only the pop up to update my apps that is incorrect. Hi, I would like to have access to other countries Apple Stores. I have iPhone 6+. What I have to do? Please step by step. I am 50+ 😉. I need to change my apple I’d on my Ipad, i bought it when I was overseas in China while I was still employed, now I am a pensioner, there is a prompt for me to enter my password for my e mail from my last job. I have forgotten it. I need to update tabs but i cant so i am miserable here. Please help. I bought an iPhone 4s from my freind, but iam unable to change the iD with the correct steps I have used. And when I want to create my own, it’s telling me that it can no longer creat a new ID.What can I do? Hae🖐🏾….my iPhone 6s cannot open iTunes…despite having bundles before it used to work but recently it refused to login into iTunes….i only see this message…CANNOT CONNECT TO ITUNES….what might be the problem..? Hello, those want change their password, simply use forgot password then you could change very easily, there is no other option like change password. I have serious problem with my phone for not been able to remember my password since,I wish I could replace a new iCloud account. Many phone uses have zero need for Apple ID, why do they force it on us????? Hidden motive? Where oh where is the ‘create new apple id’ button?? I have an Apple 6+ it has been using last three years. Now it’s asking Apple ID password but I couldn’t remember. Can you please help me to reset my password or changing Apple ID? I recently changed my Apple ID via the internet (I have a windows computer) and while I was able to change it on my iPod touch for iTunes, I cannot get my iCloud login to change to the new Apple ID. I tried to log out of iCloud but it requires the password for the old Apple ID, which isn’t valid anymore. Any help would be appreciated. For the most part, I love my phone; but this issue has brought me to this site! I thought Apple was known for having “User Friendly Apps & Programs”?!! This is absurd! Log out of the old Apple ID, and then log into the new Apple ID. That’s pretty simple isn’t it? What is the issue you are experiencing when trying to change the Apple ID? The Apple ID should be unique to you, it is your personal gateway to Apple ecosystem. can anyone help with detailed instructions. I need to get my old iphone 4 back up and running. I have ‘restored’ it through iTunes but now can’t get past the Apple ID page as it is asking for a very old e-mail address and password that I really can’t remember is there anyway of getting past this stage of the set up? I think it is showing up on ‘find my iphone’ on my old iphone 5 but not sure how to get to the next stage using this.